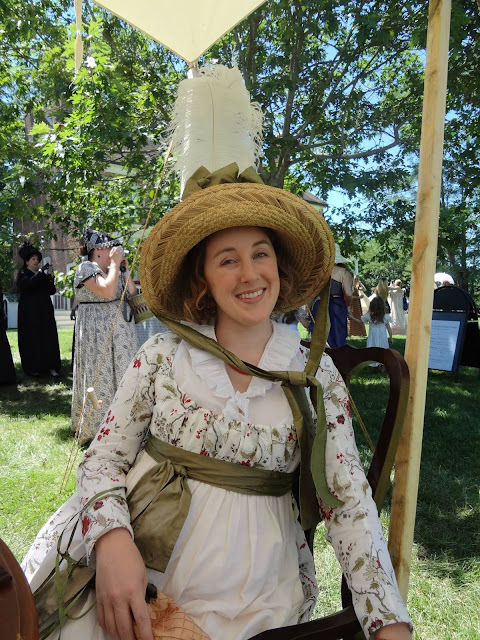 This year was my first visit to Jane Austen Festival in Louisville, Kentucky, at beautiful Locust Grove historic site. I had been to Locust Grove before on a rainy November afternoon rather a few years ago. I adored the house then, but longed to see it "brought to life" by this famous event. I knew I would need a gown to handle the heat of Kentucky in Summer, something light and cool but also fashionable. 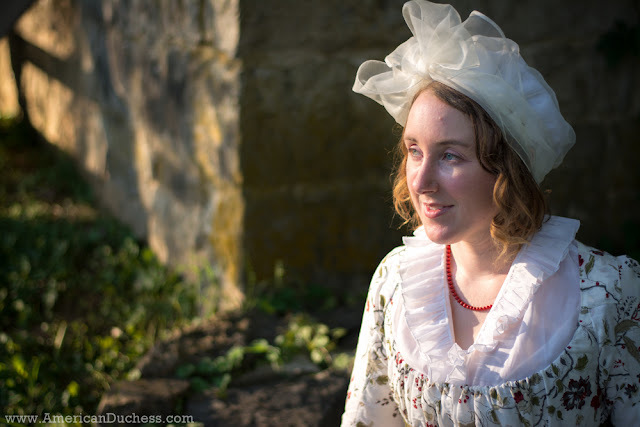 It was an easy choice to explore the late 1790s after studying and creating the gown and millinery for the American Duchess Guide earlier this year. My inspiration came from Kyoto Costume Institute, a couple of the transitional open robes in bold floral prints worn with white-work petticoats. 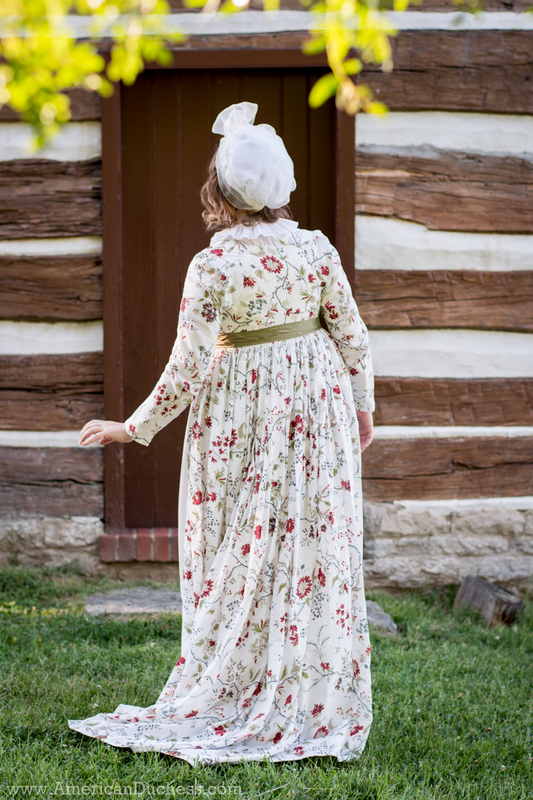 While this direction was a bit more involved than the simpler round gown, I felt that the plainer petticoat would help balance the floral print. And yes, the floral is from Ikea. Huzzah for curtains! I was very happy with this textile - 100% cotton with a linen-ish look, lightweight enough for a gown, and with a pleasing design. My only quibble (if one can even quibble when one is using curtains for costuming) is that the design is screenprinted on and a little tough to get a needle through in some places. I had originally planned to pleat the back skirt, but because I had already finished the bottom edge of the bodice and the top edge of the skirt, I stroke gathered and whipped the volume instead, which worked well with the sash and was secure and full enough for the right look. 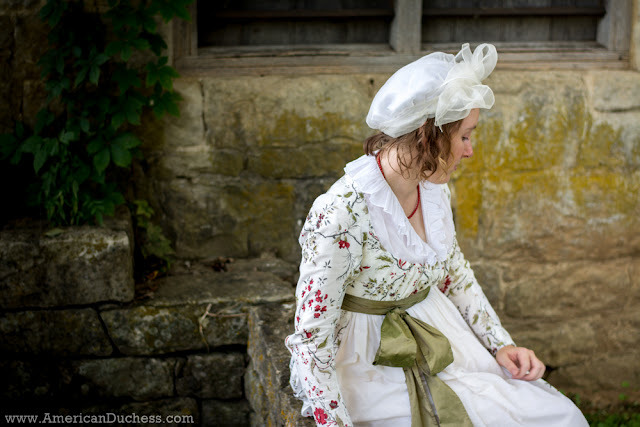 The gown bodice is constructed on a linen lining and underbodice that pins at center front. The front - two pieces on drawstrings tying at center front - is then applied over the top. 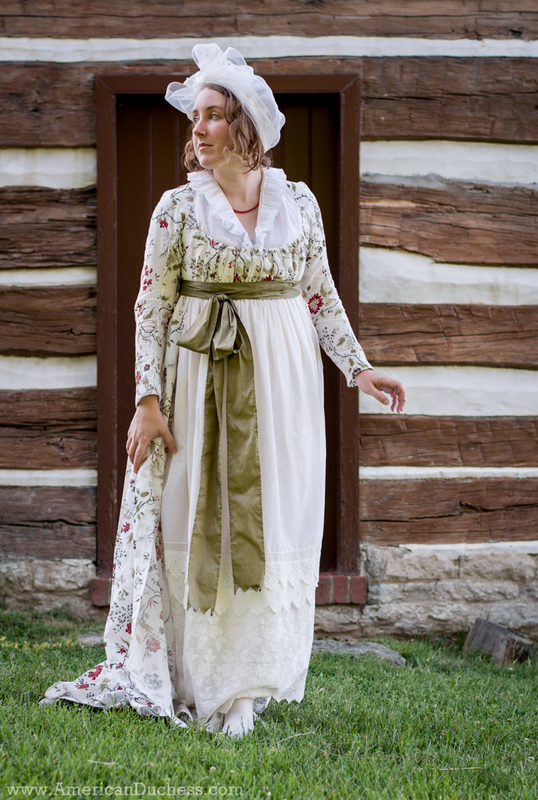 I love this transitional method so often seen on 1790s gowns, as it means you can use the same underbodice repeatedly and just do a different design over the top - surplice, bib front, gathered round or V-neck, etc. For reference, Abby's 1790s dinner gown is the very same bodice/underbodice, but how different these gowns look! It's merely a matter of what sleeve style/length, what front style, open robe or round gown? (Don't worry, we go over all of this fun in the book, too). 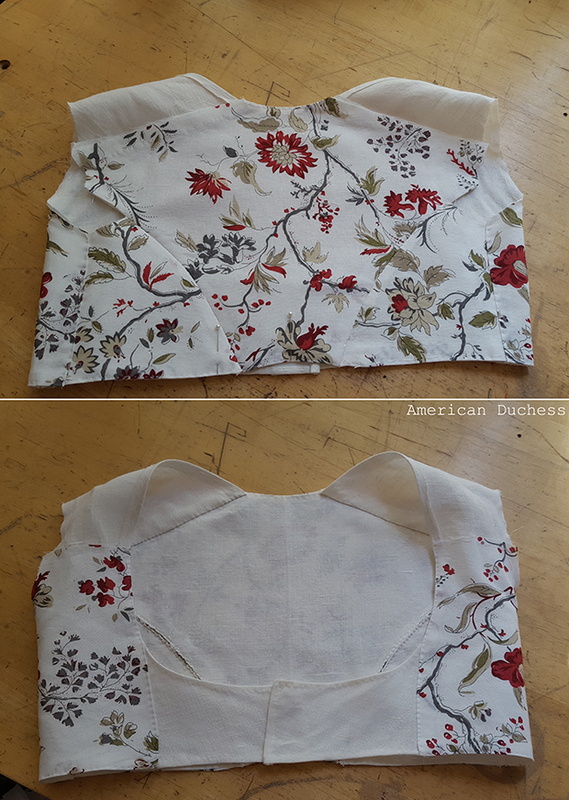 The bodice - top is the back, bottom is the front. You can see the linen left plain and just hemmed where it will later be covered by the gathered front pieces. For the event, I wore the gown and petticoat with a silk sash, ruffled chemisette, and Dashwood Regency Slippers in brown/tan. In the morning I wore a Caroline hat I re-fashioned from an old straw hat (many are the bows. many! ), then changed into the turban cap for our formal dinner. Dashwood Regency Slippers in brown/tan for Saturday. I wore the black/black on Sunday. Best of all, I didn't die. We were lucky to have rather favorable weather this year, and my gown was comfortable and easy to wear, breathable, and quite cool. I was surprised to have been more comfortable on Saturday dressed as a lady in stays and petticoats than I was on Sunday as a sailor dressed in trousers and waistcoat! Millinery and Accessories - the turban cap and chemisette are two pieces we made for the book. Coral necklace by K. Walters At the Sign of the Gray Horse. Wow, Lauren, this is STUNNING. <3 Such a beautiful dress, you look positively gorgeous in it!!! Gorgeous!! I do have a set of those curtains, I just haven't got round to doing anything with them yet! Love the look! Could you please tell me more about the sash? Single-layer, hemmed on each edge; or double-layer, seamed and turned rightside-out? Thanks! The sash is a single layer of silk taffeta, narrow hemmed on both edges. It's about 5 yards long. Yes, about that wide with 1/4" hem. Funnily enough, I was watching Pride and Prej when I hemmed it too, hahaha. I agree with Esther; simply stunning. 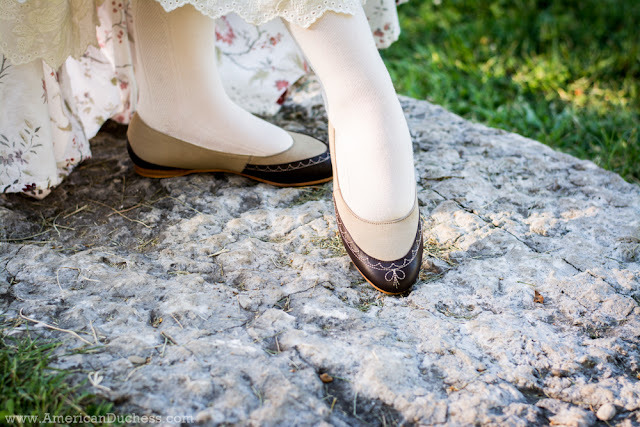 The impressive motif on the shoes is the crowning touch. The whole ensemble is lovely! I've been in a hat mode of late, and am smitten with both your options. This is such a good style on you! It looks so real and authentic and suits you perfectly. using curtains, shades of "went with the wind" Starlet, did you see them in the window and just couldn't resist? :-P the Ensem is lovely. Do you think this is accurate-ish? Yes that fabric would make a lovely gown.